There’s a lot to unpack in that title, for sure…I recently posted about the postulate that Italy possesses a figurative list of aromatic grape varieties longer than any other place on earth, and right on cue here’s another one to add to that list that I’ve not only never tasted prior to pulling the cork on the bottle this evening, but I had never even heard of either. 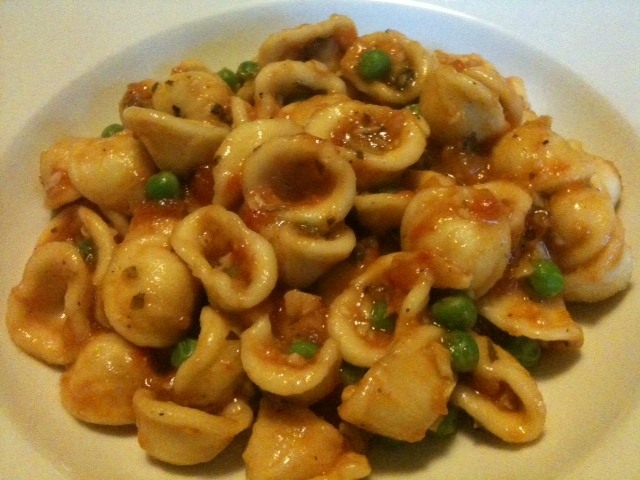 I served this racy rarity with the most Pugliese of pasta shapes – orecchiette – with a sauce I made from some leftover sand dabs I baked in a tomato/herb sauce and some added peas, and then spiedini di pollo (chicken kebabs) marinated with veggies and wine and then napped in a thickened anchovy and caper sauce, and then grilled, a recipe which I adapted from one for rabbit (why is it so expensive?) 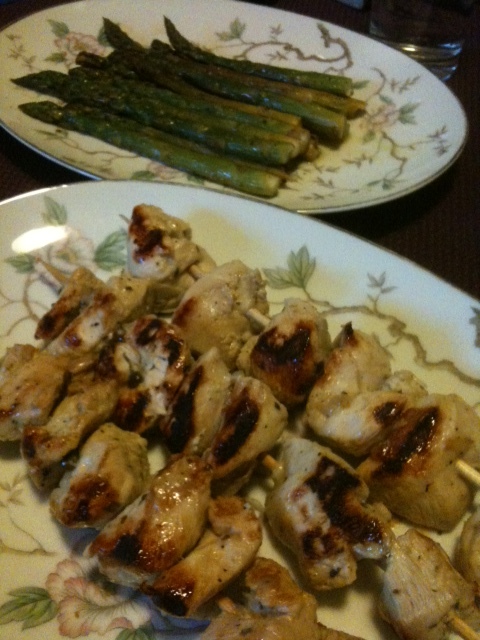 and and a side of pan roasted asparagus. Very pale gold color with a slightly coppery tinge. Popping, clean nose of pear nectar, tropical fruit punch, honeydew melon, floral perfume, fresh cut grass, sea spray, and just a whiff of light caramel. The entrance on the palate is an explosive mix of Meyer lemon, lime zest, vanilla bean, quince and apricot jam. Despite the forward flavors the medium-light body is elegantly lively and expressive, with a tart, piercing acidity and a long finish that lingers with clear flavors of dried herbs and roasted nuts. Excellent wine, very good description. 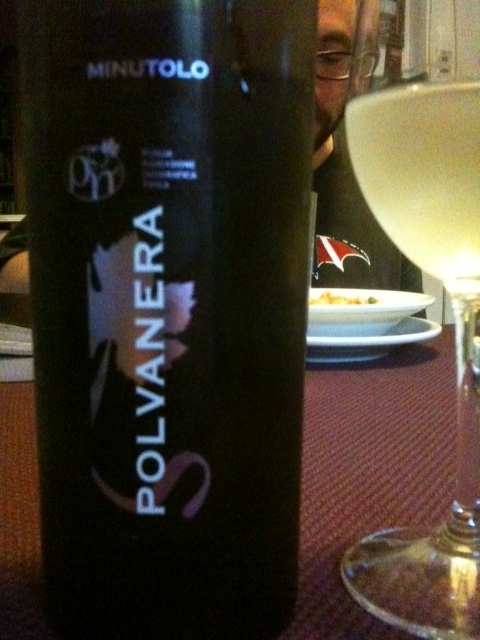 We visited Polvanera three years ago and loved most of their wines, especially this and the Aglianico. The U.S. importer, Jan D’Amore, has a marvelous portfolio of small producers like this. You are lucky to be able to buy them in NY/NJ area. Yeah, Jan’s a great guy, and his portfolio adheres to the same “honest”/authocthonous philosophy that I’ve always promoted myself. Hey Charles! Hope all is well…Yes, I think the production of Fiano Minutolo is only permissible under the IGT label because it is not included in the official “disciplinare” of any D.O.C. Why the name “Fiano Minutolo” is required over just “Minutolo”, considering that the variety has no connection with Fiano di Avellino, and could easily be confused with it is a real head scratcher, but we have to remember that many things emanating from the Bel Paese are thus.